Euthanasia. The thought of having to put a beloved pet to sleep — forever — is something most of us try to spend as little time thinking about as possible. We fervently hope that when our pet’s “time” comes, it will happen quickly, quietly — and without intervention. Sadly, that is usually not the case. Medical intervention can in many cases prolong life far beyond what Nature would have intended, sometimes with good results — and sometimes not. Chances are, if you are a pet owner for any period of time, you will be called upon to make a decision regarding ending the life of your pet. How do you go about making such a decision, and how can you feel comfortable about making it? 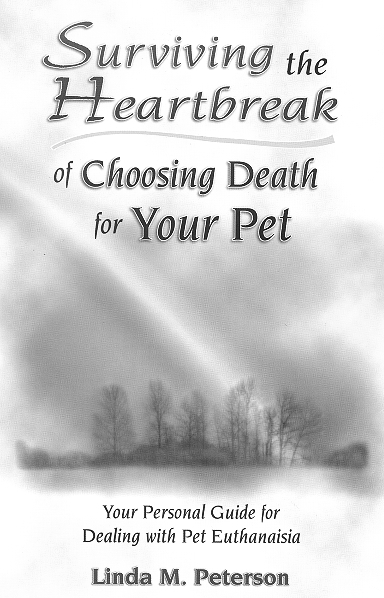 In her book, Surviving the Heartbreak of Choosing Death for Your Pet, author Linda M. Peterson guides you through making the decision of whether and when to euthanize and how to deal with the feelings you have concerning the issue. Peterson is a clinical social worker who in her private practice runs pet loss support groups and counsels those who have lost pets. She is also a pet lover who has dealt with the euthanasia issue herself and brings her own experiences into play to help others. The book is especially helpful for those who have an aged pet or one who is terminally ill. It guides you through the feelings you may have as you realize you may be called upon to make the euthanasia decision for a pet and helps you to decide when the time may be right. There are tips on how to acquire the information from your veterinarian to help you to make the decision and what to expect during the euthanasia itself. The book also has a section on how to help children handle pet euthanasia, decision-making guidelines for emergency euthanasia (i.e., the pet being hit by a car). The book also provides insight into dealing with the sense of loss and other feelings experienced after the pet is gone. Sometimes people must make a euthanasia decision for a healthy pet with intractable behavioral issues, such as aggressiveness. A special section of the book deals with the issue of euthanizing a healthy pet. The final section of the book contains a touching meditation you can use when you want to remember all the good times you shared with your departed animal friend. Included is a bibliography suggesting further reading and an appendix with sources for pet loss counseling. Having this book handy during a pet’s illness can help an owner understand his or her emotions and feel more in control during a stressful time. The tips and guidelines it contains serve as reminders of what to ask the veterinarian and the wide range of factors to consider when dealing with making the euthanasia decision. The decision to euthanize will always be one of the most difficult issues a pet lover must face, but using a resource like Surviving the Heartbreak of Choosing Death for Your Pet can help ease the way.